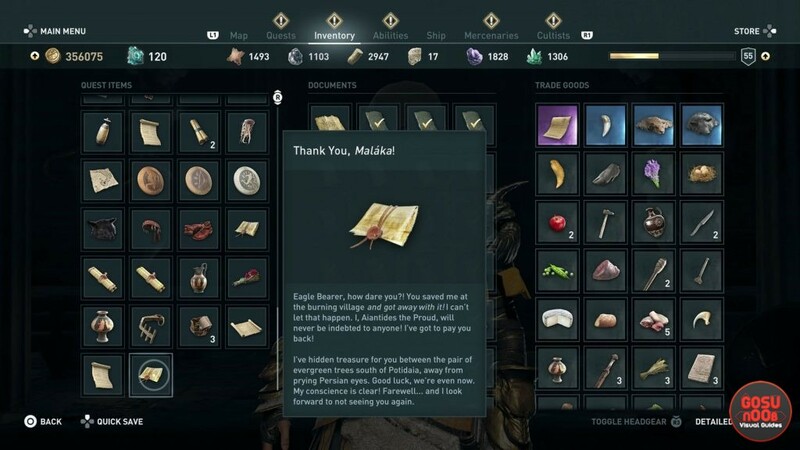 Treasure of Aiantides is a reward in the Thank You, Malaka quest in AC Odyssey Legacy of the First Blade DLC. It is your prize for rescuing Aiantides from the fire. He basically wants to repay you for the favor, being the stubborn manly man that he is. So, the question is: where do I find the treasure that Aiantides has left for me? Our AC Odyssey Aiantides Treasure Location – Thank You Malaka Quest guide will show you where to find the treasure that Aiantides gave you in Legacy of the First Blade DLC. Where to Find Treasure of Aiantides in Thank You Malaka Legacy of the First Blade DLC Quest? To find Aiantides’s Treasure in the Thank you, Malaka quest, all you have to do is follow the quest marker. The stash that Aiantides lets you have for rescuing him is about halfway down the westernmost finger of Chalkidike, south of Potidaia, as the note tells you. The note also tells you that the treasure is between a pair of evergreen trees. That’s pretty vague, especially considering that the whole area is pretty wooded, so that might prove to be a problem. Now, to be fair to Aiantides, these two evergreen trees do kinda stick out from the others. They’re really large, thick trees, surrounded by deciduous trees that, in our case, were full of fall leaves. So, the trees were really the only ones that were green. The stash is, indeed, just between them. If the description isn’t enough, please refer to the screenshots above. Besides, you still have the quest marker to lead you to the exact spot. The stash might be difficult to spot on the ground, but the game will let you know with the small, white dot above it. While you’re on your way to pick up the treasure, try not to “collect” the bears roaming around the area. We managed to have like four of them charging at us while we were trying to collect the reward, so that was fun. Anyway, if you need further help with AC Odyssey Legacy of the First Blade DLC, check out some of our other guides, including Accuse Magistrate or Doctor – Mysterious Malady Quest and Blacksmith Code – What to Answer.